Big Data - News, Views and Reviews: How to use big data to validate business vision? 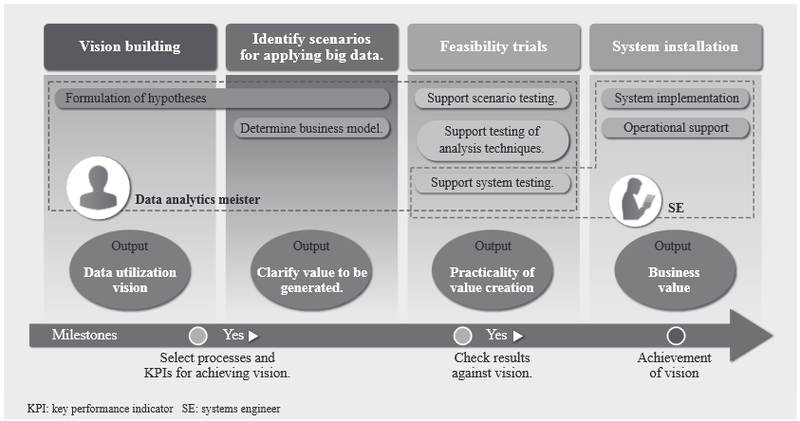 How to use big data to validate business vision? So, lets say you hear about a vision that can dramatically improve something, or create a better solution/project. What do you do? Jump right in or take a step back and look for ways to validate the grand vision. If you choose the latter keep reading. Many choose the former option (jump right ahead without any form of validation) completely ignoring the fact that very few of us are born with talent to have a gut feeling (aka vision) that actually can amount to something useful. Following diagram is taken from a new paper titled, "New IT Solution Using Human-oriented Big Data Analytics" by Jun Yoshida, Satomi Tsuji, Takeshi Tanaka published in Hitachi Review Vol. 63 (2014), No. 1. It talks about a repeatable process to ensure a much bigger chance of success of a vision then the usual process of embarking on a project with best intentions and hope. Even though the paper focuses a lot on the human behavior measurement with wearable technology and how to make use of that data for various purposes, I have chosen not to highlight that in this post. From the above picture the one big takeaway is the role engineering--Its not at the onset of the process. Involving engineering too soon might defeat the whole purpose. Engineering should be brought in only towards the end of stage 3. The vision must come from business owners and be driven by a data analytics subject matter expert (the authors call this role "Data analytics meister"). Having intermediate milestones along the way also helps keep the project management team happy. Next time an executive comes with a vision, challenge him or her to validate the vision against "cold hard data". Best of luck!